Private Messina & Taormina Private Tours Include: Our Messina and Taormina private tours include private transportation with English speaking driver-guide, taxes, parking, tolls. Departure Points: Port of Messina, Catania- Taormina. Other Departure Points Available. 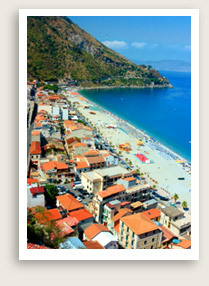 Let Well Arranged Travel take you on a private shore excursion of Taormina and Messina. Your first tour stop is Messina which has suffered both devastating earthquakes and World War II bombings. Yet it not only still survives, but boasts some of the most beautiful and important architecture and museums. You may visit the Museo Regionale which houses treasures by such artistic greats as Antonello da Messina and Caravaggio. You will also see Santissima Annunziata dei Catalani in Piazza Catalani, a stellar example of the richly decorated and eclectic 12th century Norman architecture. Outside the beautiful Fontana d’Orione is the finest fountain of its kind from 16th-century Sicily, while the fountain of Nettuno (Neptune), dating from the same period, celebrates Messina’s foundation as a major world port. The most important monument in Messina, however, is the Cathedral, erected during the 12th-century Norman reign. Most of the present cathedral was actually reconstructed after earthquake damage, though a few segments of the original walls remain. If possible, you will be in place at noon to enjoy a very special movement of its astrological clock. 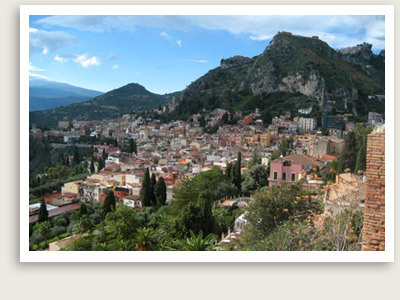 After your private tour of Messina, you will pass through a fragrant pine tree forest before arriving in Taormina. Your tour guide will take you on a tour of beautiful Taormina, situated on a rocky plateau of the steep Monte Tauro, which dominates the Ionian coast, with Etna rising majestically in the background. Downtown Taormina represents a variety of historical periods, from early Greek and Roman settlements, to Byzantine and Medieval remains, up to 15th-century Catalan buildings and 17th-century Baroque churches. You can stroll main street — Corso Umberto — with its art and designer shops, Baroque churches and Palazzos — and get a glimpse of the breathtaking Greek theatre facing the sea. Your guide will make suggestions where you can have an excellent meal. Time permitting, you will end your Messina and Taormina private tour with a visit to the charming village of Castelmola, a medieval hill town above Taormina with breathtaking views and narrow, picturesque streets.